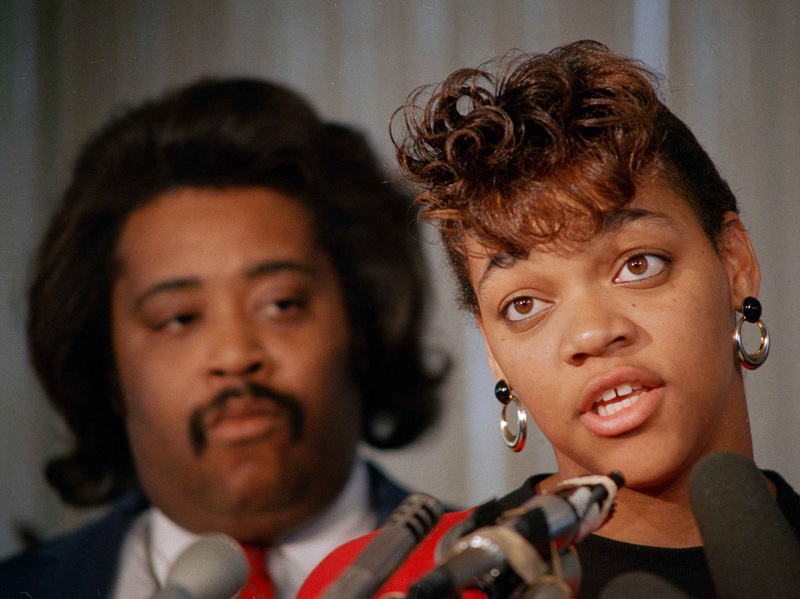 15 Years Later, Tawana Brawley Has Paid 1 Percent Of Penalty : The Two-Way As a teenager, Brawley said she had been attacked and raped by white men. The young African-American's accusations hit front pages, especially after Rev. Al Sharpton took up her case. When a jury said the tale was a hoax, one of the men who was accused sued. Now, he's getting some of the money. Tawana Brawley, with the Rev. Al Sharpton, in 1988. It was 1987 when a black teenager, Tawana Brawley, said she had been raped and kidnapped by a group of white men in Dutchess County, N.Y. Her story of being attacked, scrawled with racial slurs, smeared with feces and left beside a road wrapped in a plastic bag made front pages across the nation — especially after the Rev. Al Sharpton took up her case. But, as The Associated Press reminds readers, "a special state grand jury later determined that Brawley had fabricated her claims, perhaps to avoid punishment for staying out late." In 1998, Steven Pagones, who was the county prosecutor at the time, won a defamation suit against Sharpton, Brawley and Brawley's attorneys. They had accused Pagones of being among Brawley's attackers. "Sharpton has since paid off his [$65,000] debt with money raised by his supporters," the Village Voice says. Brawley was ordered to pay $190,000. It's been 15 years. With interest, the judgment against the now 40-year-old Brawley has grown to more than $430,000. Finally, the Poughkeepsie Journal reports, Pagones is receiving some of the money: $3,700, or about 1 percent of what he's now owed. According to USA Today, "a Virginia court ordered Brawley's employer, The Laurels of Bon Air nursing home in Richmond, to garnish her wages. ... She's currently paying Pagones $627 each month." Pagones petitioned for such an order after the New York Post reported that Brawley is now employed as a nurse in Virginia. "It's a long time coming," Pagones tells the Post, which adds that the former prosecutor is "more interested in extracting a confession from Brawley than cash." "Every week, she'll think of me," he also told the Post. "And every week, she can think about how she has a way out — she can simply tell the truth." Over the years, critics, politicians and news media have demanded that Sharpton apologize for his role and publicly condemn Brawley. But Sharpton has refused, perpetuating the ill will that many still hold for him. "What do I have to apologize for? I believed her," Sharpton says. He says he regrets having resorted to "name-calling" against Pagones and that the case taught him to refrain from personal attacks in his activism. But he doesn't regret having stood for Brawley, he says.